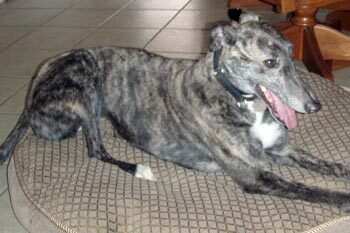 Bonita, aka Gil’s Bonita, is a stunning, almost 4-year-old dark brindle female born April 8, 2005. Her sire is Dodgem By Design, making her grand sire the late famous Gable Dodge, and her dam is Jr’s Trouble. 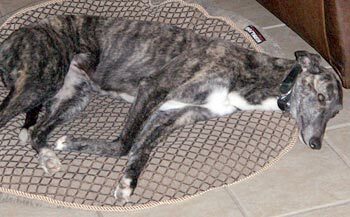 Bonita spent the last 18 months or so as a companion pet in a vet clinic in east Texas. When her dog companion died last year, the custodian decided to give her a chance at finding her own family and couch! Bonita is figuring out the day in and day out routines of living in a house, and she loves the dog door! Bonita and the cats: Bonita was a bit scared of Molly’s anger at meeting yet another greyhound. Bonita seems to be a very sweet girl who is just a bit leery of new things. At this time I would say that Bonita is cat trainable, but with the ones that are a little shy it is sometimes hard to be sure. Make sure when introducing Bonita to a new cat that precaution and a muzzle are used. We may want to test Bonita with cats again and with small dogs at a later date.